This might be long but it's an expansion on what you have seen via Instagram so here you go. Threw myself in the deep end here. They say it's the best way to learn. So why have a smaller competition like a National Championships as your international debut and just jump on the second biggest track and field stage there is behind the Olympics (haha). So that's what I did and next thing I was booking flights to London. Probably the best decision I ever made. It was pretty scary at first never travelling internationally solo before yet alone to the other side of the world yet alone with a heap of camera gear but you learn pretty fast. London is English speaking so was a good call for my first comp. The London public transport is incredible tho, it was so easy to get around I was able to explore the city and of course explore the incredible Olympic Stadium. My god it's was bigger than I imagined, times that by 5. The Olympic park itself was massive and it would take a decent walk to get to the actual stadium, then pretty much getting yourself mega lost to get inside the stadium where the media centres are. I legit got somewhat lost every day. Lucky for me I had made friends with American sports photographer based in Portland, Howard Lao, an ex track athlete himself, on Instagram so we finally connected and it was nice having both of us getting lost haha. Through him I met the amaaazing Jeff Cohen god of track and field photography, which was epic and it was so epic seeing what he produced at the champs. After a while I knew the stadium at the back of my hand from walking around finding photo spots it forced you to learn. Stadium shooting was a big challenge but a good one. Back home in NZ I pretty much can roam where I like round the track, whereas here you were super limited to the outside and even then you were limited, so forced you to be creative which helped my photography immensely. You had to apply for infield access which I was lucky to get for day 1 for my girl Eliza McCartney's Pole Vault Qualifier and my mate Ben Langton Burnell's Javelin Qualifier. You got one jump/ one throw so don't miss ahahahha. Lucky for me I knew exactly where I wanted to go, I just had to remember this is in the same layout as the tracks in NZ, it's all the same minus the 40,000 people. It was beyond epic going inside!!! We were super super lucky to have Canon CPS services on board these championships!!!! They provided a loanout service so I was super stoked to be able to give the gods gift to photography Canon's flagship 1DX Mark II a whirl every day. As well as some beautiful prime lenses to give extra reach and add to my arsenal. Shout out to Sports Lab for fixing me upon my return to work from carrying a stupid amount of equipment. Not only new stadium but a new equipment I was getting a hang of which was a beautiful challenge. And on top of that I made awesome friends who were all super talented photographers! People who I look forward to seeing in the future!!! Worlds was the greatest experience I ever had, and I look forward to many more to come! I was exhausting but so rewarding and exciting all at the same time. You might be tired during the day but when the night came, when all this went down, you were beyond awake!! Something like no other! So here below is my fave image from each day , not necessarily for the image itself but for the story behind it I experienced. Day 1: Eliza qualifies for the Final, and my first experience infield. DAY 1: Yes Bolt ran, yes Mo Farah won his last ever 10km but for obvious reasons this was my fave from day 1. Not only the nerves from shooting in this stadium for the first time and any athletics in a mass stadium for that matter, but also shooting one of my close friend in the infield. Hahaha stress levels very high. But it was amazing I got to shoot a whole round as well as this one :) the dark sky and floodlights provided an amazing background, as well it being pretty special to share the infield with Eliza even tho it was only for 15 minutes hahah. Day 2: Bolts finale: the big 100m and his lightning bolt! Day 3: Proud. She gave it everything she had and did it with a smile on her face. DAY 3: My boo gave it her all. Super proud friend moment right here!!!!! From a banger 2017 opener to a crater in the road, Eliza still hung in there and fought till the end. Despite everything she STILL made the final coming 9th which many could only dream to do. No matter how bumpy the road no matter the setback she still gives it her all with a smile on her face. And that's what I am most proud of, evidence of her character and who she is as a person. I'm proud how she fought this whole journey leading to this. This is just the beginning of her ever exciting journey! Day 4: Walsh on top of the world! DAY 4: It's pretty special hearing your own national anthem blasting through this giant stadium! Proud kiwi moment right here. Congratulations Tom for your epic performance and heres to many more to come! Day 5: One hell of a pole vault showdown: Kendricks takes Gold. DAY 5: On a cold London evening, there was one epic pole vault battle! Sam Kendricks, Piotr Lisek and World Record Holder, Renauld Lavillenie battled all the way to 5.89. Chagrui Xue scored a PB as well as a National Record of 5.82. End of the day it was 24 year old Kendricks on top for his first World Title after taking Bronze in Rio last year with 5.95, with still a big future ahead! Day 6: Fire and Rain: The Women’s 400m Final. DAY 6: It was again, cold, and this time raining (great). Well at least the outfield photographers were under cover when the rain behaved. Rain is always a fun challenge, makes for epic photos! The women’s 400m was one heck of a race with many surprises!!! The Olympic Champion who fought to the line to take down Allyson Felix in Rio, Shaunae Miller-Uibo pulled up towards the line, injury or straight up 400m lactate (us 400m runners know exactly what that is) when she was looking like she was going to take it out, coming in 4th while Phyllis Francis of the USA fought hard to take her first World Title and a new PB of 49.42!!! Salwa Ed Naser of Bahrain also clocked a PB and a new National Record of 50.06 to take the silver with Allyson Felix coming in bronze with a 50.08! So much drama so exciting! Day 7: Ben Langton Burnell in the Javelin Qualifier. DAY 7: Another time to experience the infield!! By day 7 things are starting to heat up!! So it was an epic experience being inside of it! I got one throw and this was it then I was out, and I was pretty happy with this! It would be the last time I got the wicked experience of shooting in the infield these games. Day 8: Emma Coburn and Courtney Frerichs take down the might of Africa in the steeplechase with Gold and Silver to the USA! DAY 8: Holy what a race!!! Firstly Beatrice Chepkoech of Kenya took a wrong turn an missed the first water jump, but first time ever two americans took the top two places in the event!!! With Emma Coburn for the win in a new championship record! Such an epic race. 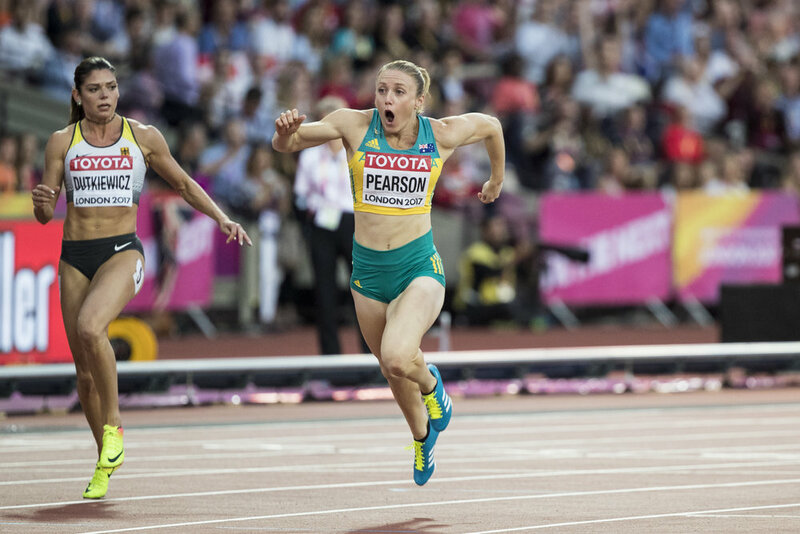 DAY 9: Awesome to see Sally Pearson back on top again in an awesome race with a stella field including an Olympic Rio Champion AND the World Record Holder!! Day 10: USA Destroy the field in the 4x400m and Allyson Felix gets her 16th World Championship medal and another title to add to her resume. DAY 10: USA killed the 4x400m relay!! Lead start to finish and destroyed everyone, but there was an epic race for Poland and Great Britain for silver and bronze. And when the Brits are in medal contention, the crowd goes wild! The dude that stole the show pre Bolt's 100m final ahahahahhaha entertained the media room for ages. Shout out to the security for his commitment tho.